• Everbilt 1/4 in. 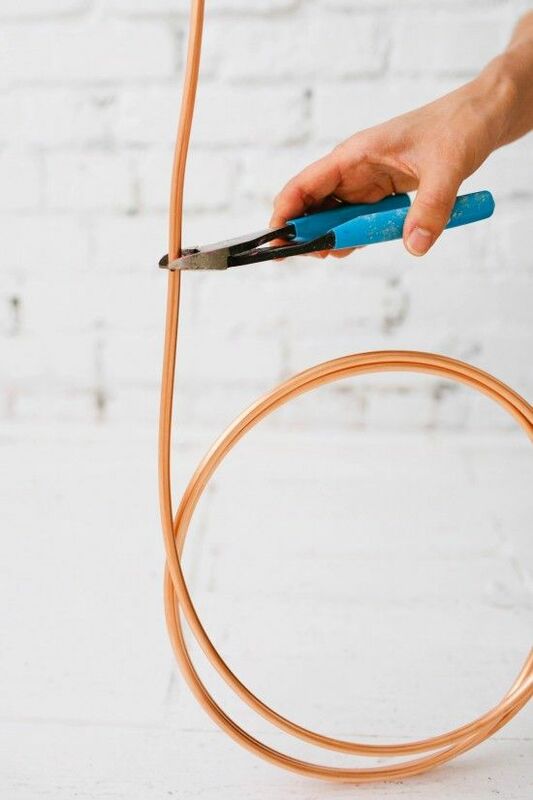 x 10 ft.
• Unroll and straighten 30” of copper rod. 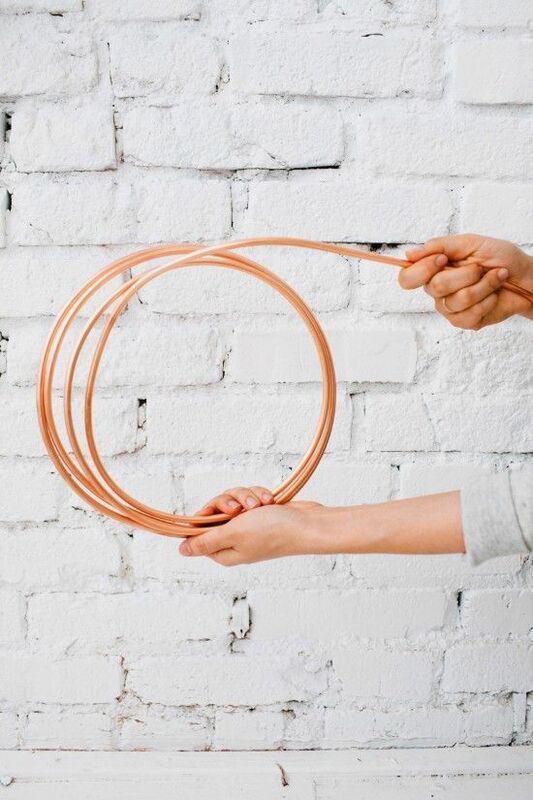 Copper is soft enough that you can bend it with your hands. 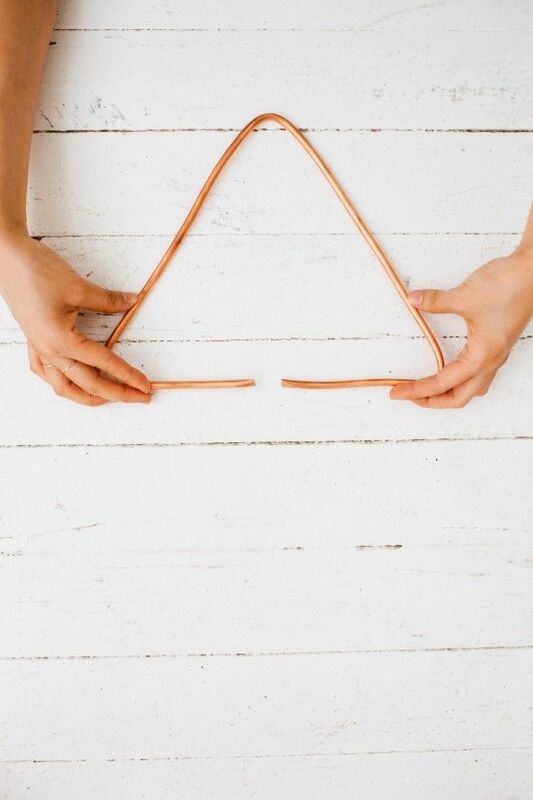 • Bend at marked points to create a triangle. 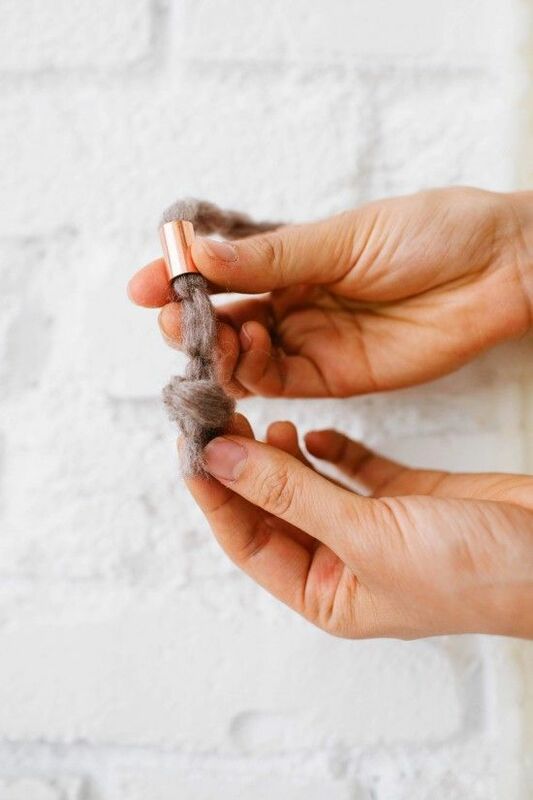 • Push the two ends together – they will be concealed by the yarn. 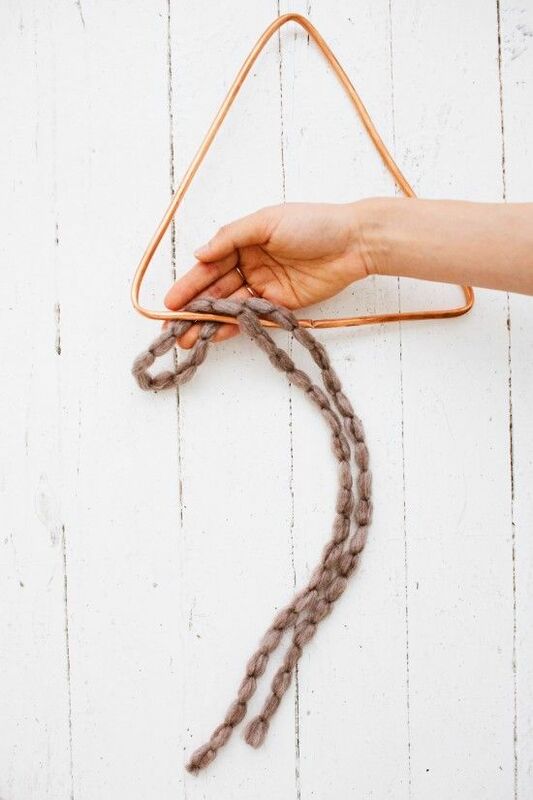 • Fold pieces of yarn in half and tie to frame using a . 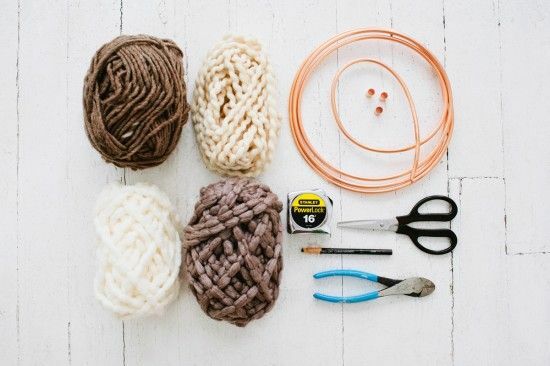 • Attach the copper couplings to the ends of the yarn by threading the yarn through and then tying a knot. 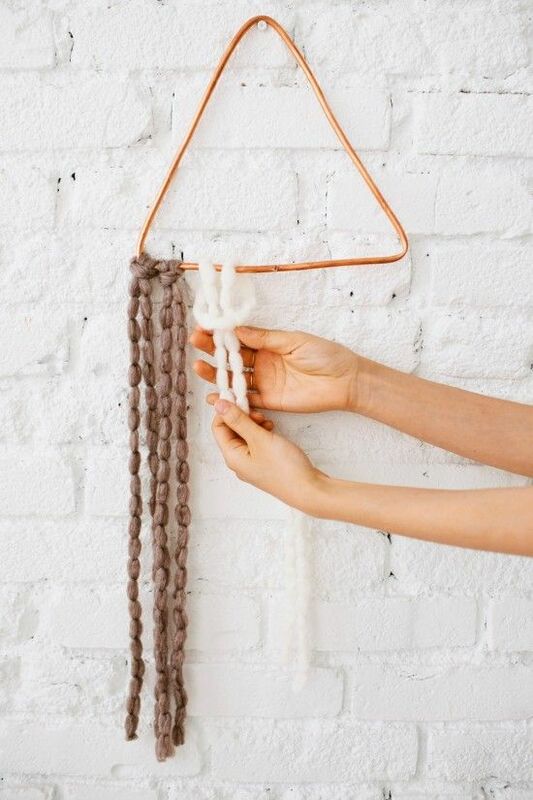 Distribute the 10 pieces evenly across the bottom edge of the wall hanging. 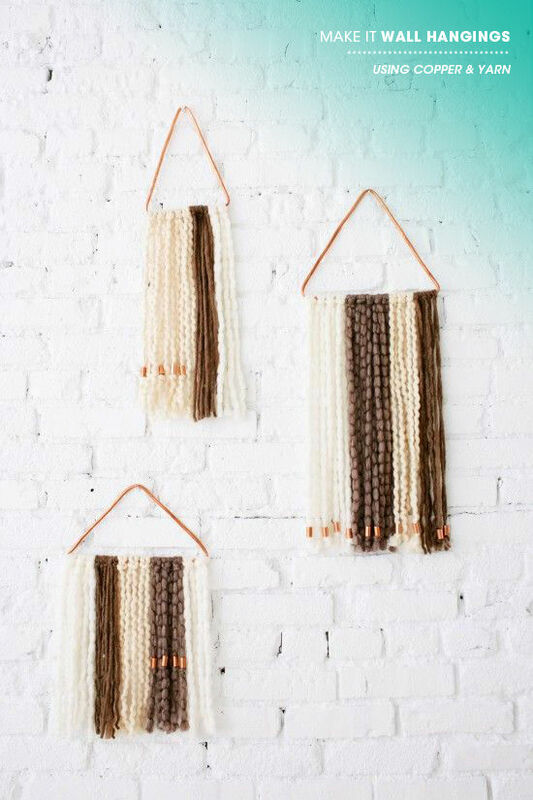 • You will have enough materials left to make two more wall hangings. 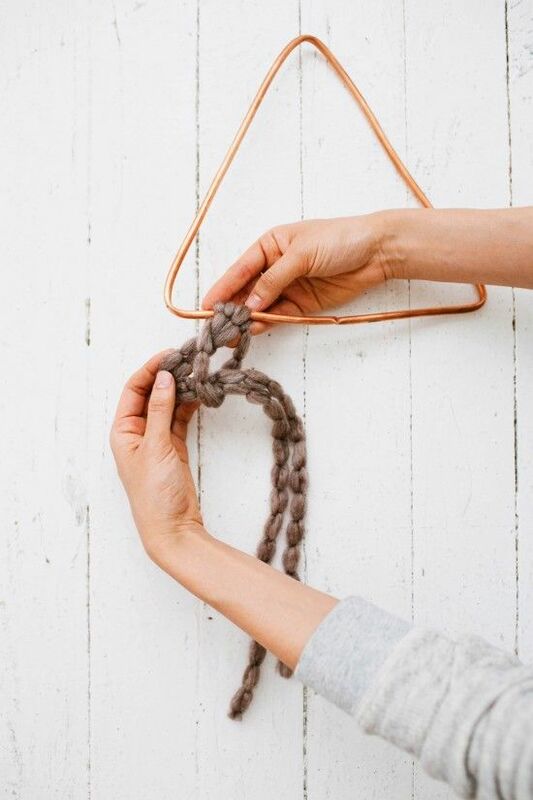 Experiment with making different sizes of isosceles triangles and using varied yarn lengths. Pretty easy, right? We hope you give them a shot! 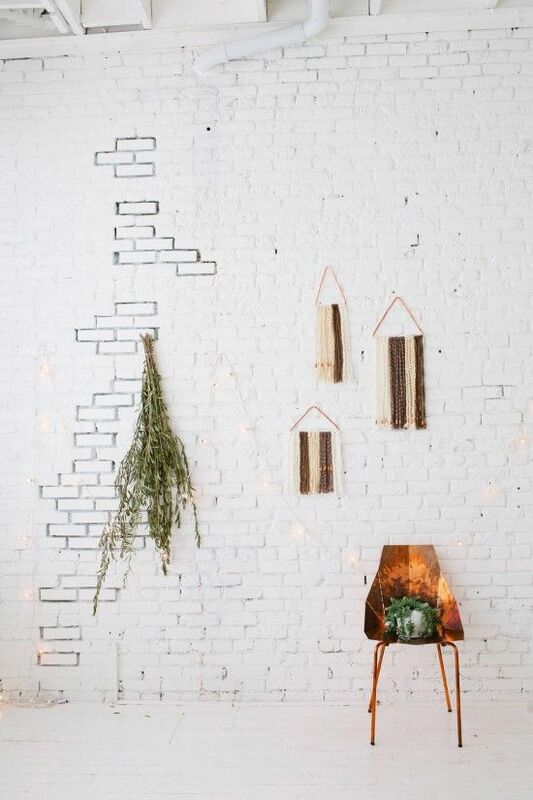 so cool, i love the copper accents! 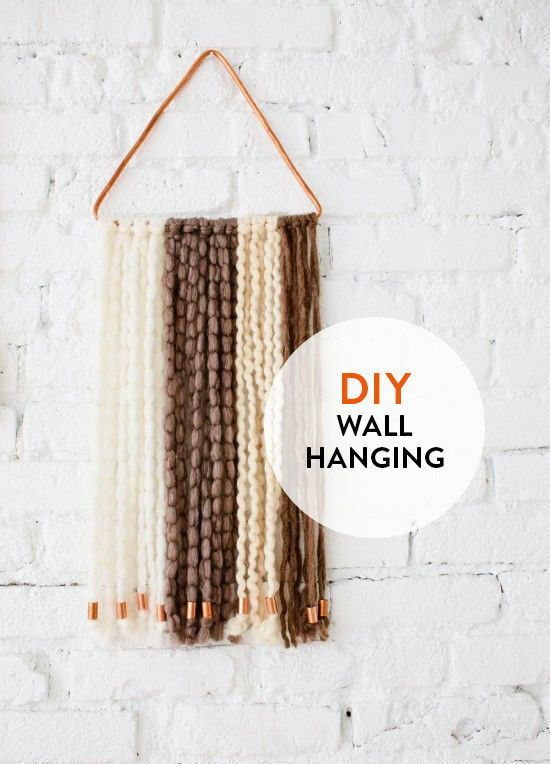 Love this wall hanging – helllo weekend project! 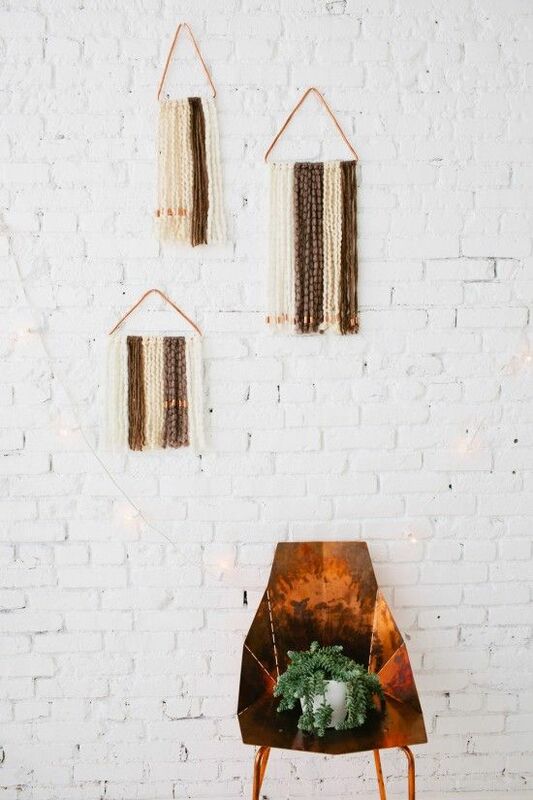 I am in love with any type of wall hanging right now and actually have the perfect spot in my office for one. I think I’ll try this soon! 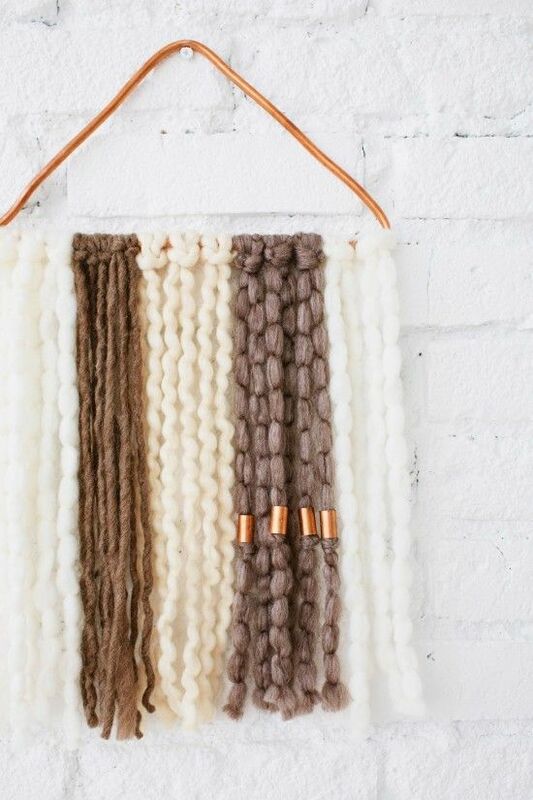 love this and went to jo anns looking for similar yarn! 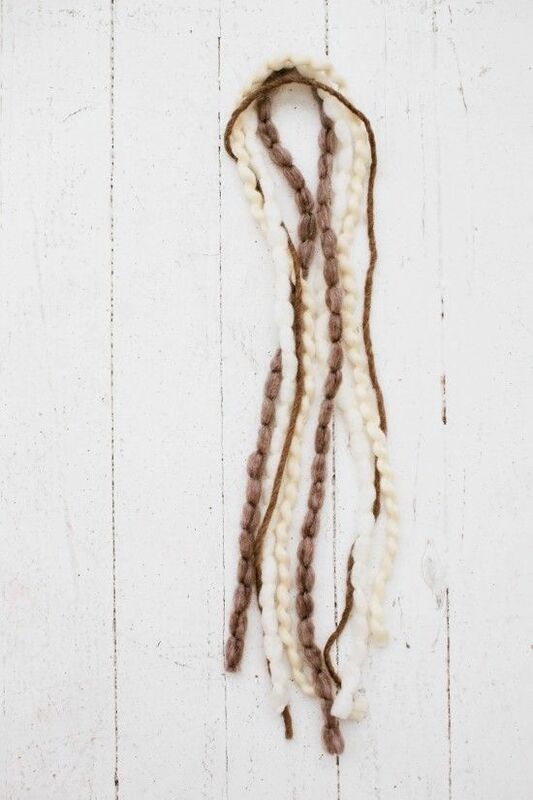 do you know the name and brand of all the yarn i couldn’t find two of them? thank you! Hi to all, as I am in fact keen of reading this web site’s post to be updated regularly. Yes! Finally someone writes about rugs 5×8. loved the usual information a person provide to your visitors? Love this! 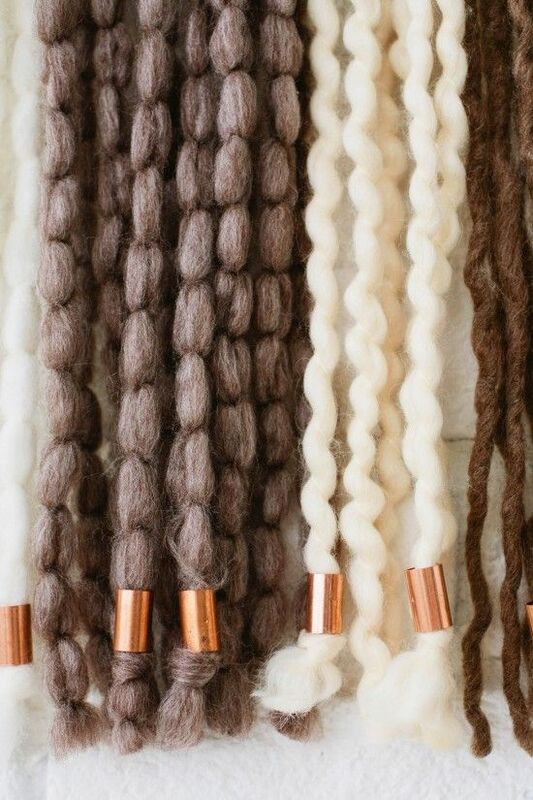 Shannon, one of the yarns is called Cobbles by Patons: . Not sure of the others but they look great together! brussels. I will be grateful when you continue this in future. Lots of other folks shall be benefited from your writing. going to find yourself stuck in thousands of half finished projects and an IM venture that won’t ever be a success. is first; set up shop. My blog looks weird when browsing from my iphone4. website, how can i subscribe foor a blog website? So cute! Looks so great on that amazing wall! Fiat money:Fiat money refers to money that is not backed by reserves of another commodity. and install the dependencies before you install the freeware. software that manages the communication satellite systems could be derived very quickly. overwhelmed .. Any recommendations? Cheers! Love it! 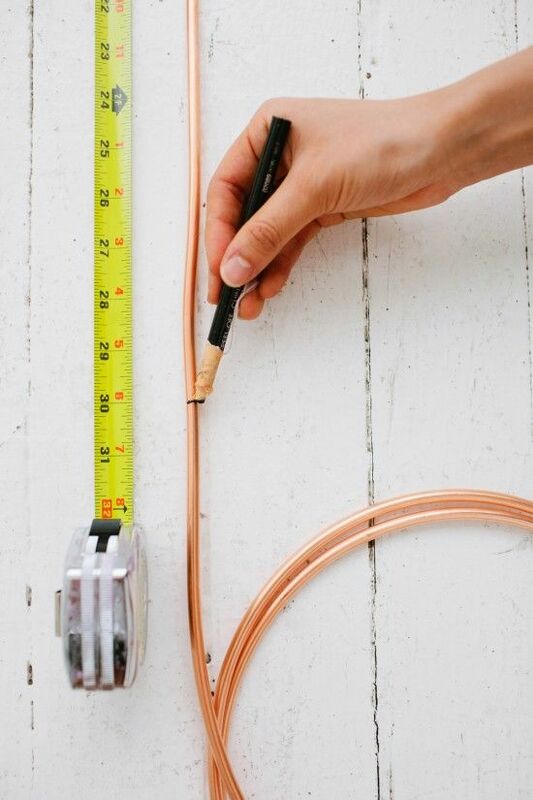 How does the copper wire hold together? Anyone know? of your web site is excellent, as well as the content! When you have an structured strategy, arranging your activities properly according to your existing home and work life, you can expect to steer clear of mayhem, rushed days, as well as unexpected occurrences. weight, how you look in your clothes and how you feel about yourself. By becoming chubby, your success are affected inside the workplace therefore. that’s both educative and entertaining, and without a doubt, you’ve hit the nail on the head. in my hhunt for something regarding this. I have go through lots of web blogs together with gone through some,but your job is certainly remarkable.Hats off for your personal determination not to mention dependability.Do maintain us all well informed in future too. Hey there are using WordPress for your site platform? I’m new to the blog world but I’m trying to get started and set up my own. Do you require any coding knowledge to make your oown blog? I have been surfing online more than 3 hours today, yet I never found any interesting article like yours. It’s pretty worth enough for me. 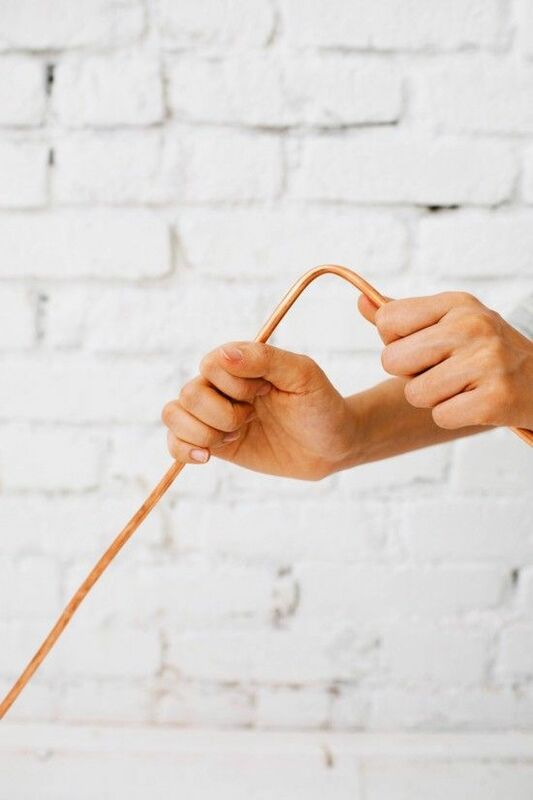 Personally, if all website owners and bloggers made good content as you did, the net will be much more useful than ever before. I’m planningg to start my own website soon but I’m a little lost on everything. have time I will be back to read more, Please do keep uup the fangastic jo.